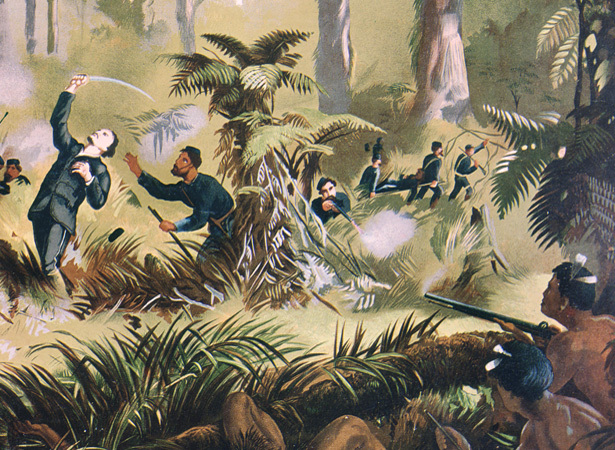 The Prussian soldier of fortune Gustavus Ferdinand von Tempsky was killed during an assault on Tītokowaru’s south Taranaki pā. His exploits during the tumultuous 1860s had made him a folk hero for many settlers. Aged only 40 when he died, von Tempsky had earned a reputation as ‘one of the most colourful characters of nineteenth century New Zealand’. An adventurer, writer and soldier, he was also an able watercolour artist who captured many scenes of the New Zealand Wars. He served with the Forest Rangers, a colonial force established during the Waikato War. Von Tempsky’s commission as an officer was granted on condition that he took out British citizenship. By the end of the Waikato War he had reached the rank of major and established a reputation as an intrepid leader and strong disciplinarian who was popular with his men. In 1865 he won praise from Premier Frederick Weld for a successful attack on Kākaramea pā in south Taranaki. Shortly afterwards, however, he was charged with disobeying orders. The defence minister, Harry Atkinson, had ordered von Tempsky to place himself and his troops under the command of Lieutenant-Colonel James Fraser, a recent arrival in the colony who had been promoted over von Tempsky’s head. An incensed von Tempsky offered to resign, but a court of inquiry cleared him of all charges. The public sided strongly with von Tempsky and his reputation in the settler community soared. In January 1868 he was appointed to the Armed Constabulary, the new colonial regular army which was commanded by Thomas McDonnell. On 7 September this force attacked Tītokowaru’s strongpoint at Te Ngutu-o-te-manu. The troops were severely mauled and after some indecision McDonnell ordered a retreat. Von Tempsky was killed outside the pā before he could receive this order. Māori referred to the flamboyant and apparently fearless soldier as Manu-rau – a hundred birds – because of his ability to rush from one place to another like a flock of birds. Perhaps it was significant, then, that he died at Te Ngutu-o-te-Manu – ‘the Beak of the Bird’. We have 20 biographies, 13 articles, related to Von Tempsky killed at Te Ngutu-o-te-manu.